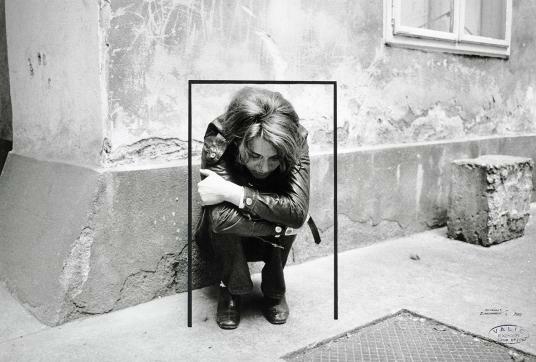 VALIE EXPORT, Squat Within II, 1972. Gelatin silver print with black paint. Harvard Art Museums/Busch-Reisinger Museum, Purchase through the generosity of Andra Freifrau von Fuchs and Markus Michalke, 2004.52. © Valie Export/Artists Rights Society (ARS), New York/VBK, Austria. Austrian artist VALIE EXPORT (b. 1940) is one of the most important pioneers in conceptual media art, performance, and film. In this lecture, the artist will discuss her oeuvre, from her early Expanded Cinema works and conceptual photography to her most recent drawings and works in public spaces, as well as future projects. The Busch-Reisinger Museum Lectures, sponsored by the German Friends of the Busch-Reisinger Museum, present important speakers on topics of central and northern European art. Modern and contemporary art programs at the Harvard Art Museums are made possible in part by generous support from the Emily Rauh Pulitzer and Joseph Pulitzer, Jr., Fund for Modern and Contemporary Art.